The LG Optimus 4X HD is the finest Android handset from LG as we wait for the Optimus G to appear. 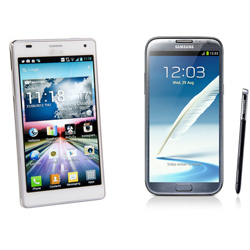 It qualifies to be compared with Samsung’s best, the Galaxy Note II. Both are equipped with big screens, big processors as well as 8MP cameras. The Note II however, is not meant for all due to its huge size. The Optimus 4X HD is more regular. So which will you prefer? We’ll help you in your choice.